Whether you’re beating the summer heat or desire a sweet drink, a glass of horchata is perfect for any occasion. If you don’t know what horchata is, it is a delicious rice-based drink and a type of agua fresca. Aqua fresca in Spanish means “fresh water,” and typically is made with fruits, flowers, or seeds mixed with water and sugar. Horchata is one of the popular aqua frescas and can be bought in Mexican restaurants or bodegas. 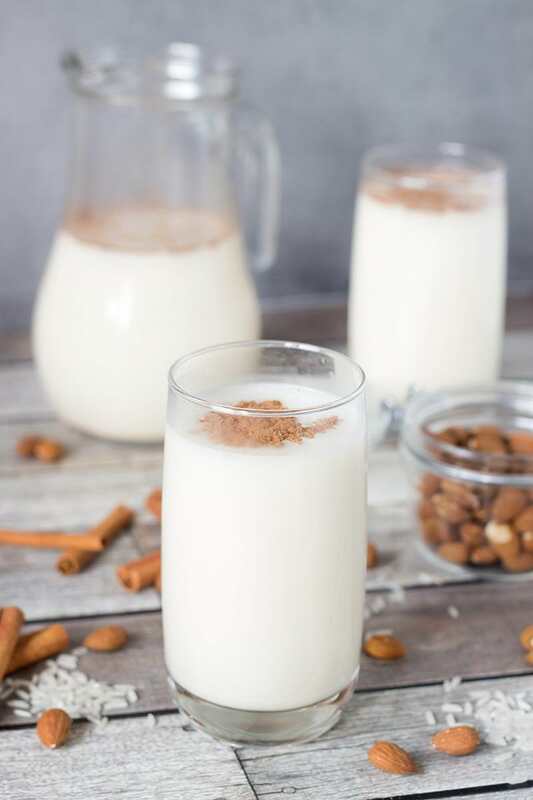 Now if you’re like me and sometimes want a nice, cold glass of horchata but don’t want to bother going out, you can make a fresh pitcher at home with this fantastic, authentic recipe my tía taught me (with my little tweaks, of course). This drink is typically not vegan, but I made some minor changes to accommodate my lifestyle, and I recommend giving it a try. The great thing about horchata is that you can add different ingredients to change the flavor. 1 You can also use shredded coconut if desired. 2 Optional, but if you want just regular sugar, then it will be 1 ⅓ cup. 3 For nondairy evaporated milk, bring unsweetened almond or coconut milk to a boil and turn it heat down to about medium to low and let it simmer for 35-40 minutes (whisk occasionally!). 4 Can use dairy, almond, or coconut milk. I like to use Silk’s Vanilla Almond Milk, but you can also make your own. Start by soaking the rice, chopped almonds, and cinnamon in the large bowl and let it soak in the fridge. I like to break up the cinnamon stick, and I do garnish it with ground cinnamon to give it a bit of a kick, but that is up to you. I recommend putting it together before you go to bed, otherwise, let it soak for about five to eight hours. Once it’s been soaked long enough, strain the water out of the mixture. Put the rice, cinnamon, and almond mixture in the blender with the evaporated milk. You can blend it all at once, or you can do it in parts. I personally do it in parts since my blender is a bit smaller. Make sure to blend it for about 3 to 5 minutes. You want to make sure that it is smooth and that the mixture is thoroughly ground. Strain the liquid into your pitcher. If you don’t have a fine mesh strainer, I definitely recommend getting some cheesecloth (even if you do have one) so that fewer grains get into your pitcher. If you do end up getting some large grits, you can bundle up the cheesecloth and squeeze the water out and then discard the grains into a bowl or something. Do this in parts or all at once, whatever works best for you. Once you strained all of the blended mixtures, I recommend straining it again to get rid of any grainy bits that may have made their way to the pitcher. After that's done, put your sugar, milk, and vanilla and mix. Add the liter of water and mix once more. If you want to make more but don’t want to wait to soak the mixture again, keep adding milk and water along with sugar to add some sweetness. To serve, pour a glass with ice and garnish with ground cinnamon if desired, enjoy! August 13th, 2018 at 08:27pm, sebastian michaelis.